Virtual base class for expanding atoms. Definition at line 251 of file BinarySymbolicExprParser.h. Property: Title to use for documentation. Shared-ownership pointer to an AtomExpansion. Definition at line 254 of file BinarySymbolicExprParser.h. Expand a parsed atom into some other expression. This method takes a token parsed from the input and optionally replaces it with some other expression. For instance, a subclass that recognizes the token "true" would replace it with a single-bit constant 1. If this object does not recognize the token, it should return a null pointer. This phase of expansion occurs immediately during parsing; a second phase may occur later. 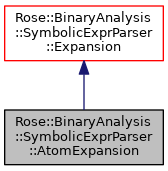 Implemented in Rose::BinaryAnalysis::SymbolicExprParser::TermPlaceholders, Rose::BinaryAnalysis::SymbolicExprParser::RegisterSubstituter, and Rose::BinaryAnalysis::SymbolicExprParser::RegisterToValue.